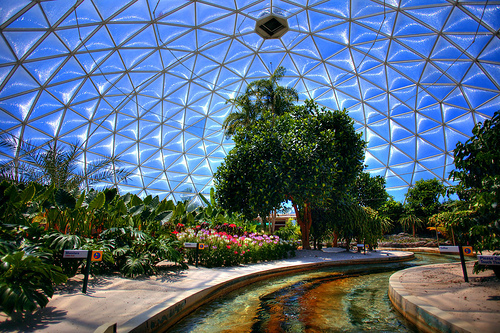 Top Five locations in EPCOT to wait out a Zombie Apocalypse! I probably should have done this around Halloween but I had the idea a little too late. Recently I was watching Walking Dead (great show!) and I thought… if I happened to be at Walt Disney World when the zombie apocalypse kicked off, where would be the best places to wait it out? It was an interesting idea and I decided to put my thoughts down on paper. These are actually in no particular order so I’d love for my readers to vote (via the comments) on which one they’d pick! The first thing that came to mind was food and water – something you’ll definitely need if you want to wait out the apocalypse successfully. For that reason, Living with the Land is a great selection since it houses a ton of fruits and vegetables that grow there. It even has some fish farms for much needed protein. All in all, from a food and water perspective, this is THE place to be in EPCOT. But, Living with the Land is not without its drawbacks, too. The one that comes to mind immediately is its vulnerability to infiltration by zombies. It has a lot of entrances and exits connected to it, that means you’d need a pretty big group to defend it which could be difficult. There’s also lots of nooks and crannies where zombies could hide out if they got in. As you all know, dining and snacking is one of my favorite parts of any Disney World vacation. But, snacking is often over looked among st the rush to get as many ADRs as possible 180 days before your trip. So, I wanted to put together this article for five tips that will help you snack throughout your trip! If you’re feeling a little warm over at EPCOT there’s an easy way to avoid shelling out a few beans for a soda. Stroll over to EPCOT’s Club Cool where you can sample – for free – Coca Cola sodas from around the globe. To be fair, though, some of the beverage options may be a little exotic, but you should be able to find at least one that’ll whet your whistle and give you the cool boost you need.